It was not clear which was more popular at the recent Chelsea Flower Show, blooms or booze. Traditional favourites of champagne and Pimms were definitely being challenged this year by gin. 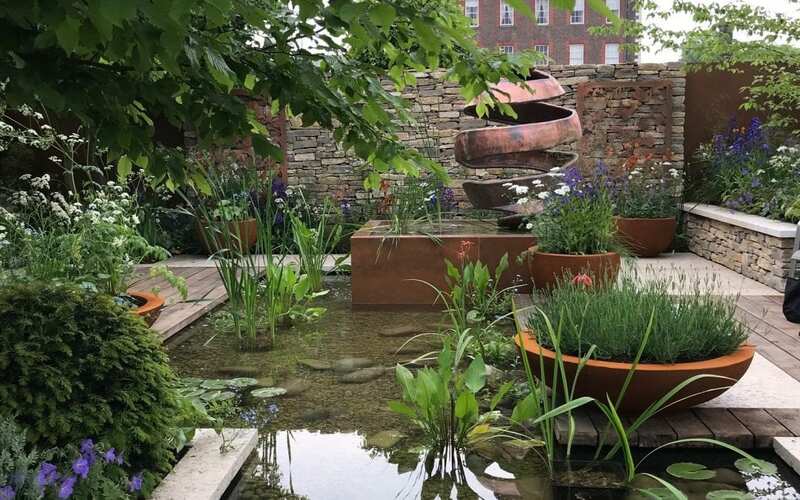 Guild Member Silent Pool were showing their stunning show garden, inspired by their Silent Pool Distillery, located in the beautiful Surrey Hills. A raised, infinity-edged water feature reflected the spring-fed Silent Pool, a source of water for the gin. The gin-making process was represented through laser-cut copper panels, copper distillation helmets and a central ‘citrus peel’ sculpture. The planting, in tones of blues, whites, greens and copper, blended to create a calming ambience. Five of Silent Pool Gin’s 24 botanicals were used, including angelica, iris and rose. Guild member Warner Edwards won a RHS Silver medal for their garden inspired by their distillery at Falls Farm, Northamptonshire. The farm is situated on the remains of medieval terraced gardens, now a beautiful stepped grass landscape, which was represented in the garden’s topography. The choice of planting reflected the natural ingredients used in the creation of Warner Edwards gins, many of which are grown in the distillery’s botanical gardens and farm hedgerows. The water feature represented the farm’s own natural spring, the water from which is used for distillation. The use of natural materials, including Northamptonshire stone, mimicked the farm’s own stone walls, and copper features represented the distilling equipment, creating an authentic feel. Bee-friendly plants reflected the farm’s apiary, and thyme and lemon balm with the garden also featuring handmade traditional beehives made by the WE team under the supervision of their apiarist. Having tempted botanical appetites, the Warner Edwards Gin Barn, a beautiful stone and wood concept with bar, rustic hay bale seating area, plant wall and even a spring water bottle top-up feature proved to be one of the most popular Chelsea ‘watering holes”. Congratulations to both for their beautiful contributions to the Flower show and for ensuring that the gin profile was kept to the fore for such an auspicious audience.